Cincinnati will host its annual three day cyclocross festival this Friday through Sunday. The weekend consists of the Darkhorse Cyclo-Stampede (C2), Java Johnny’s Lionhearts International (C2), and the Harbin Park International (C1). The heavy favorite has to be Jeremy Powers, who is coming off the potent combination of a strong European campaign and a rest weekend. He’ll be looking for the sweep this weekend. Standing in Powers’ way is Ryan Trebon. The last time these two riders went head-to-head, they split victories, something that could easily be repeated in Cincinnati. The Cannondale p/b Cyclocrossworld three-headed cross monster of Tim Johnson, Christian Heule, and Jamey Driscoll will also be in attendance, with all three riders looking to pick up a victory. The last time they took the top spot was Heule’s victory at the first day of the Gloucester GP on October 1st. Tim Johnson looked good last weekend and will be gunning for victory. However, the always crafty Jamey Driscoll could pick up a victory as well – especially if Powers and Trebon are overly concerned with each other. With three days of racing, it’s entirely possible to see some of the big favorites take it easy on Day 1 or Day 2 and let some eager riders up the course to duke it out for the podium. Outside of the usual cast of characters, look for Travis Livermon to figure into the picture as well. Tristian Schouten is scheduled to race on Sunday only, and could be a top-five finisher like he was in Boulder – as could Powers’ teammate Chris Jones. Last but certainly not least, Belgian Ben Berden will be looking to pick up another UCI win. He surprised Trebon and the rest of the US cross community last weekend with his victory in Boulder. Clearly gaining form, he might be transitioning from a chaser into a field-leader. Rounds 5 and 6 of the New England Professional Cyclocross Series brings the region’s top stars to Northampton, MA for the oldest UCI cross race in America. The brain, brawn, and looks behind the operation, Adam Myerson, continues to put on an excellent weekend of racing at Look Park. After a weekend of rest, the streak is back on the line for BikeReg/Joe’s Garage rider Justin Lindine. After rattling of four straight victories, Lindine suffered from mechanicals in New Gloucester, ME two weekends ago. However, Lindine was able to bounce back on day 2 to capture his fifth straight UCI victory. Lindine looks to be the strongest rider on the start list once again and could pick up his sixth and seventh straight UCI victory and seal up the NEPCX overall. Lindine’s biggest challenge could from Philadelphia Cyclocross Schools Lukas pair. Lukas Winterberg picked up his first UCI victory at HPCX last weekend in New Jersey. Meanwhile, his teammate Lukas Muller continues to have a strong season and could figure in the mix. Outside of the aforementioned riders, this weekends racing will be wide open, allowing some lesser known riders the opportunity to pick up UCI points and make a name for themselves. Keep an eye on RGM-Richard Sachs rider Christian Favata, who rode to 5th place last weekend at HPCX. The Maple Leaf Jersey will be on the line this weekend in Toronto, Canada. All the big names will be there battling it out for their right to dawn their nations colors. Last year’s winner Chris Sheppard will be looking for a repeat. However, the heavy favorite has to be Craig Richey. Fresh off a pair of top three UCI finishes on the East Coast, Richey will be looking to pick up another huge win. Mike Garrigan finished second in Toronto last year and if he shows up, he could pick up the victory. Mark Batty has had a strong season this year and cannot be overlooked as a potential winner. Other riders to watch include Derrick St. John (fourth last year), Aaron Schooler (thrid last year) and Shaun Adamson. 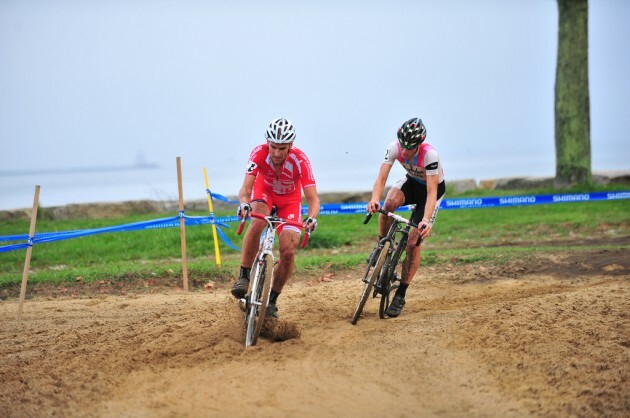 This entry was posted in Featured, Races and tagged berden, Canada, cincinatti, cyclesmart, lindine, national championship, north american cyclocross, powers, trebon. Bookmark the permalink. Hi, Heule's injury all healed for this weekend?